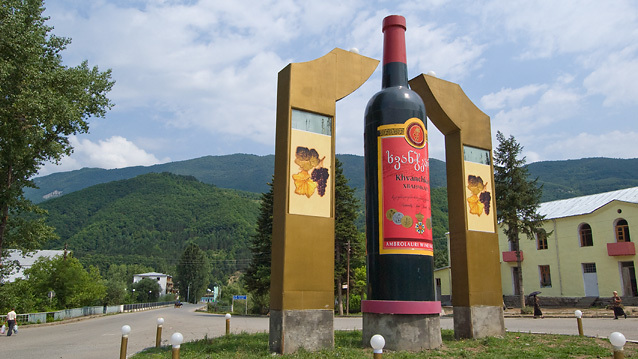 Racha region is famous for it's wine. .
AMBROLAURI IS the administrative centre in the Racha region. The main trademark for Ambrolauri is the Khvanchkara wine. 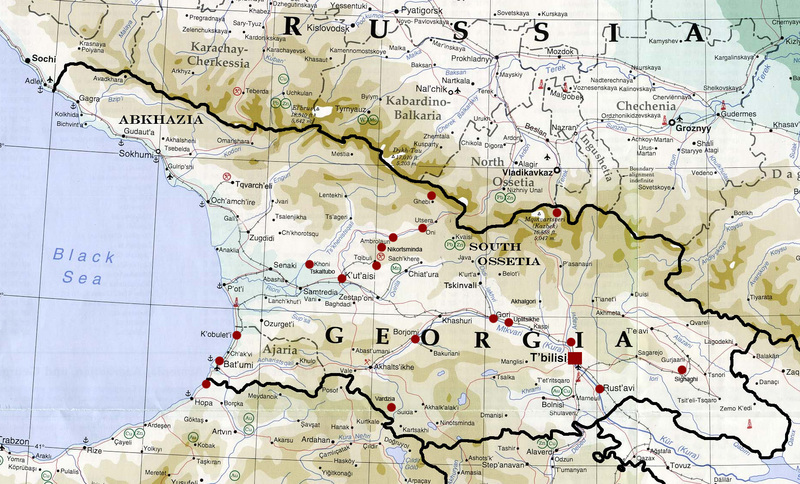 It is ranked among the best wines you can get, not only in Georgia. It was Stalins undisputed favorit. 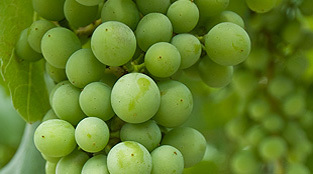 The Khvanchkara is a fruity wine with a rich flavour. The grapes are grown along the riverside at small farms. The quality of the grapes can change just on a couple of houndred meters. The reason for the high quality is the amount of sun they get in this hot and dry valley. Ambrolauri is at a level of 600 meters, but the surrounding landscape is stretching up to 1500 meters, giving cars a real challenge up to Nikortsminda, just 10 kilometers south. In the North West Svaneti, with its extreme mountains is the natural border, allthough Ambrolauri is the administrative center also for Svaneti. My driver became very thirsty all of a sudden as we approached Ambrolauri after a trip up to the Upper Racha on the South Ossetian border. 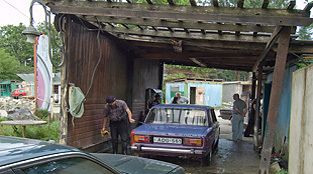 So we decided to have a beer and wash the car at a place that obviously was a gathering place for the car-guys in Ambrolauri. I wouldn't know, because my driver and I only communicated with signs or gestures. What I can say, was that he seemed thirsty. So my driver went to get a beer, and I was left with the car and some guys. The natural thing to do in order not to look too displaced and lost was to bring out my camera, and pretend to be occupied with something. But Georgians don't mind speaking to strangers that is very occupied looking occupied. So there I was: Lost at the car wash with a bunch of Georgians having fun with me. The guy cleaning cars.. yes there was only one cleaning cars, the rest was watching...had a great time telling jokes. I think. Because the guys laughed a lot. Then the six dudes in the brand new Lada Niva entered the stage. To get six guys of this size into a Niva is close to a place in the Guinness Book of Records. Anyway this took away some of the interest in me. For a second. Then all of them focused their interest in me and my camera. They wanted to be photographed in front of their car, it seemed. Still not understanding anything of what they said, I tried to gesticulate, and maneuvering them them into a casual pose in front of the car. The chaos was total. I tried several angles. No luck. The guys didn't seem to understand what I wanted them to do, or didn't agree. There was a lot of arguing in the group,and at a point I thought they were about to forget about me and the photo. But suddenly the big one on the left with a white shirt, the driver took a decision. No more casual style! He gave a short but clear order, and all of a sudden they had found their places, their face expressions and posture in front of the car. They all fitted into the picture. It was like the pieces in a puzzle all of a sudden had fallen in place. All I had to do was to press the button. Voila! The exact pose they had done a thousand times, it seemed. The Perfect posing boys in front of the shiny Niva.